Well, we do desperately need the rain. Last night's garden collection comprised a meagre 42 moths of 22 species: Orange Swift (1), Agapeta hamana (1), Celypha lacunana (1), Agriphila straminella (1), Agriphila tristella (7), Agriphila selasella (3), Blood-vein (1), Common Carpet (1), Currant Pug (1), Lesser Treble-bar (1), Brimstone Moth (1), Pale Prominent (1), Flame Shoulder (2), Lesser Broad-bordered Yellow Underwing (1), Setaceous Hebrew Character (2), Feathered Gothic (1), Straw Underwing (9), Flounced Rustic (2), Cloaked Minor (2), Vine's Rustic (2) & Straw Dot (1). Nothing there to shout about, although at least Feathered Gothic was new for the year. Continuing the trend being followed by many other species it was early, in this case a week earlier than I've ever recorded it before. Confirmation please - Phycitodes binaevella? 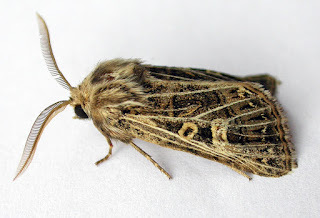 Cloaked Minor and Bulrush Wainscot?